Grace College officials and community leaders participate in the Dr. Dane A. Miller Science Complex groundbreaking (L to R): Bill Burke, Chairman of the Board, Grace College and Seminary; Dan Hann and Greg Sasso, former Biomet executives and personal friends of Dane Miller; Dan Williamson, Group President Joint Reconstruction, Zimmer Biomet; Mary Louise Miller; Dr. Bill Katip, President, Grace College and Seminary; Rich Haddad, CEO and President, K21 Health Foundation; Hayden McCloskey, Grace College environmental studies student; Dr. John Lillis, Provost, Grace College and Seminary. 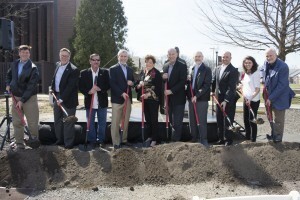 Grace College, Winona Lake, Ind., broke ground today (Friday, March 24) on the $8 million Dr. Dane A. Miller Science Complex on its Winona Lake campus. The complex is part of the Aspire Campaign for Grace College and Seminary, a $37 million campaign announced yesterday to empower the next generation to lead and serve well. For nearly 40 years, Grace College students in the Department of Science and Mathematics have studied in the Cooley Science Center to become physicians, researchers, mathematicians and medical professionals. In those four decades, the department has grown sixfold and now includes 13 different science majors and 11 pre-professional tracks. Simultaneous to growth in science programs, Grace has added environmental studies, exercise science and a nursing program in partnership with Bethel College. The Cooley Center has also housed the Lilly Center for Lakes and Streams since its founding in 2007. The new science complex is named after the late Dr. Dane Miller, co-founder and 39-year president and CEO of Biomet. Dane was a Warsaw and Winona Lake resident for nearly 40 years. Dane and his wife, Mary Louise, have invested substantially in the local community, including at Grace College and Seminary.